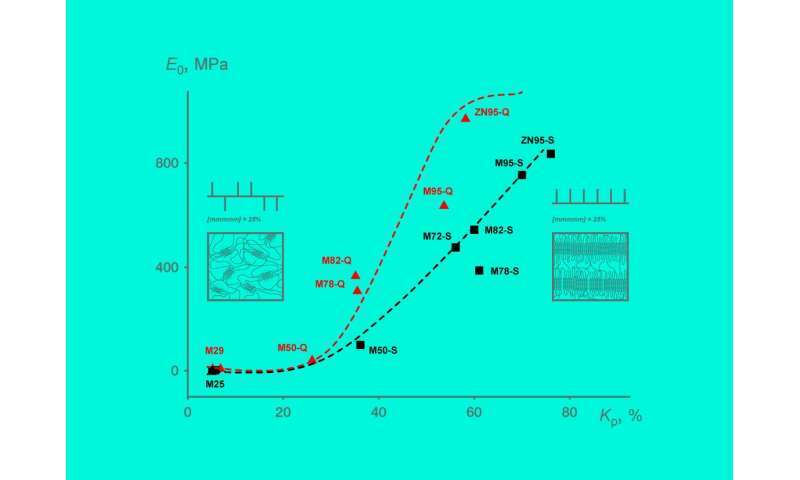 A team of researchers at the Institute of Synthetic Polymer Materials of the Russian Academy of Sciences, MIPT and elsewhere has determined how the regularity of polypropylene molecules and thermal treatment affect the mechanical properties of the end product. Their new insights make it possible to synthesize a material with predetermined properties such as elasticity or hardness. The paper detailing the study was published in Polymer. In terms of production volume, polypropylene it is second only to polyethylene. 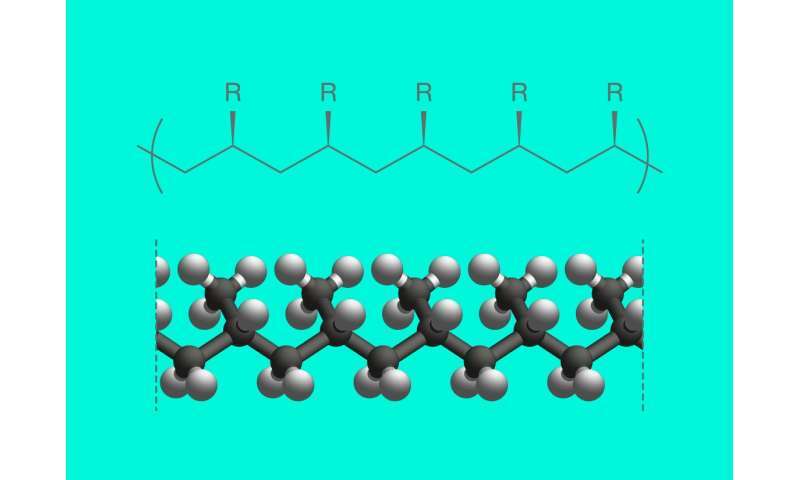 By tweaking its molecular structure, polypropylene can be used to manufacture materials with a wide range of features, from elastic bands to high-impact plastic. 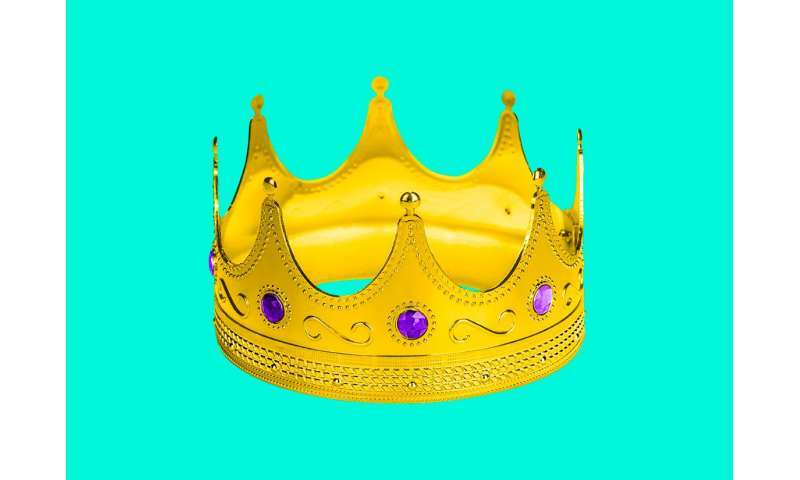 However, the relationship between the polymer's chemical structure and its mechanical properties is not fully understood. What makes the properties of polymer materials so variable is their makeup. A polymer molecule is a long chain of repeating units of unequal length. If these molecules are jumbled up more or less at random in a material, it is said to be amorphous. Such polymers are soft. In other materials, the polymer chains form interconnections called crosslinks. This gives rise to regions of highly regular atomic structure (fig. 1), similar to that of crystals, hence the name crystallites. They hold the whole molecular network together, and the more crystallites there are in a material, the harder it is. 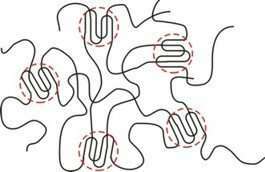 To form crosslinks, molecular chains need to possess a certain structural regularity called isotacticity. A polypropylene chain consists of a backbone of carbon atoms with attached hydrogen atoms. Every other carbon atom in the chain has a methyl group attached to it. Two adjacent carbon atoms in the chain with the hydrogen atoms and the methyl group bonded to them constitute a repeating unit called propylene, or propene. The spatial configuration of the macromolecule—the polymer chain—is determined by the mutual orientation of the methyl groups in the chain (fig. 2): If they are all on one side, the molecule is said to be isotactic. 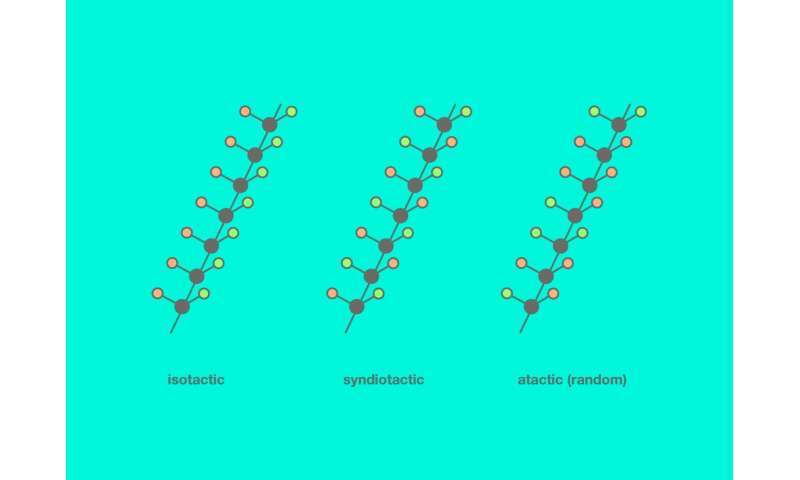 If they alternate between facing one way and the other, the arrangement is known as syndiotactic. The absence of any consistent pattern is referred to as atacticity. Isotactic chain segments are very effective at forming crosslinks. Therefore, a higher degree of polypropylene isotacticity results in a stronger material. Chemists can synthesize polypropylene with predetermined isotacticity. The authors set out to establish the precise relationship between the material's mechanical properties and isotacticity. The degree of isotacticity of a polymer is expressed in terms of the content of pentads in it. A pentad is a perfectly isotactic molecule segment that is five repeating units long. The researchers examined polypropylenes characterized by various degrees of isotacticity: specifically, 25, 29, 50, 72, 78, 82, and over 95 percent. Samples of each type of polypropylene were obtained in the form of films, 0.5-0.7 millimeters thick, using two distinct techniques: namely, quenching of the molten material in ice water and cooling it at a rate of 3 degrees per minute. The films were then subjected to stretching at 10 millimeters per minute on a testing machine. Using the results of mechanical tests, the authors plotted a stress-strain curve for each of the samples. They found that the behavior of the samples under strain was related to their isotacticity and thermal prehistory—that is, whether they were cooled slowly or rapidly. The researchers depicted this relationship as a dependence of the elastic modulus on the degree of crystallinity (fig. 4). Higher elastic moduli correspond to tougher materials. The degree of crystallinity is the percentage of the crystallites—as opposed to amorphous regions—in the volume of the material. The team also showed that the crystallites in quenched and slowly cooled samples differed in their form. "Many people make attempts to improve the properties of polypropylene, since the return on the efforts invested is great. It is produced by the millions of tons, and one need only tweak the chain structure or preparation conditions slightly to obtain a material with desired properties," says author Maxim Shcherbina, who teaches at MIPT and is a leading research scientist at the Laboratory of Functional Polymer Structures of the Institute of Synthetic Polymeric Materials, RAS. "During synthesis, you determine the structure of the molecule. But when you do that, you also determine the properties of the network and thus the properties of the material. This is the major conclusion we draw in the paper. Right now, we are doing similar things with polyethylene—another quite popular polymer."